The Cape Town Vaudeville is the new dinner theatre in the Mother City, the place to go to and to be seen when in Cape Town. The new stylish entertainment destination which opened last December incorporates a 300-seater supper club offering superb food and live entertainment. And there is adjacent Fez Club for superb drinks and music too. Vaudeville, which is following on the global "Supper Club" phenomenon, offers outstanding entertainment choreographed by the innovative party architect Dirk Vervaeke, who also has done outstanding choreographies for many prestigious events in Europe and for Cirque du Soleil. The magical show and theatrical atmosphere, produced by Will Travel and Andrew Florenca of The Sunroom, include a wonderful performance mix of burlesque, circus arts, global street entertainment and live music to excite the audiences. 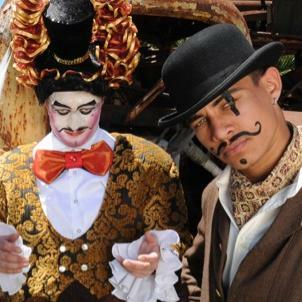 Performances take place six nights a week and will show stunning displays of artistic talents. There will be tap dancers and pole runners, trapez acrobats, jugglers and fire acts as well as even Olympic gymnasts to take your breath away. The five piece band Jinx led by Vaughn de Ville entertain the guests between the amazing acrobatic acts. During the show the diners will be waited on with a delicious three-course meal created by super chef Andrea Foulkes and her team from Dish Food & Social whose famous fare is a riot of flavour and colour. The adjacent Moroccan-themed Fez Club, was also re-launched by former Fez patron Darren Skinner who is delighted to have the Fez at the same location so that patrons can conveniently continue the party after their dinner and the show at Vaudeville. This dynamic venture has been conceptualised by Robert Sawyer and Tom Pearson-Adams of RSTPA Media (Pty) Ltd whose vision it is to create the Mother City’s most sought after nightspot. Robert Sawyer, who has got 25 years experience in hotels, restaurants and bars, is more qualified than most to embark on a project of this nature. He almost magically turned the once unknown hotel The Farinet in Switzerland’s Verbier into the world’s number one Après Ski venue and Vaudeville will be Robert Sawyer’s 100th venue opening. His business partner Tom Pearson-Adams comes with 15 years experience in and around the European music industry with numerous international broadcast and licensing credits including the first global Ministry Of Sound DVD and introducing the sales of the George V (Buddha Bar series) label to the UK. Celebrate Valentine’s Day this year with a dinner at this great new Party Venue. On February 14, 2010 you can treat your loved one for a special evening with stunning dinner show and special treats like welcome cocktails and the three-course dinner. And if you so like, put on a magic mask which you also can buy at the venue and be awarded with great prizes. The show will start at 7.15pm and the costs for this Masked Mayhem are from R350. Where? Cape Town Foreshore: 11 Mechau Street, off lower Bree Street. When? Six nights a week from 20.15h until 23.00h. Any other questions regarding Cape Town Vaudeville Supper Club? Then have a look at their own FAQs with info on dressing code and opening times here.